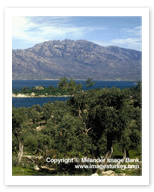 Bafa Lake was once a gulf of the Aegean Sea but was transformed into a lake as the sea retreated due to silt deposits dropped by the meandering Meander River. Today it is filled with freshwater, and the abandonment of nearby towns due to townspeoples’ need for access to the sea has left us with some beautifully preserved cityscapes around the enormous, picturesque, mountain-ringed lake. Bafa Lake has become a park, and is now protected because of its importance as a wintering area for numerous species of birds.